I am sitting here tonight thinking about so very many things but it all keeps coming back to one HUGE event for me! I can’t focus on any of my actual work as I just realised that in just 36 days time, I am heading to Austin for QuiltCon, the inaugural Modern Quilt Guild conference and show. Needless to say, I am completely thrilled at the opportunity and also at the prospect of seeing Austin for the first time – I have travelled to Europe and Canada, but I’ve never been to the USA. I’m starting to plan my packing so am in need of a few tips… We are in the middle of an extremely hot summer and with most of the past two weeks hitting around 38 degrees Celsius (100F), it’s tricky to get my head into packing for winter mode. So, anyone been to Austin in Winter? What do I need to take? Where can I shop when I get there for a great coat? Any thoughts about travelling solo? Are you going to be there too? Do come play with me, it’ll be amaze balls, I guarantee it!!! This entry was posted in Uncategorized on January 14, 2013 by procrasticraft. 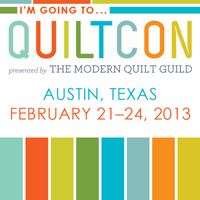 I love that you’re coming to Quiltcon all the way from Australia– and that Austin will actually be cold to you! All I know about Texas weather is that it’s unpredictable. It could be 30 degrees F one day, then 80 the next. I’ll be coming from Alaska so I won’t have to worry about coats. But I’m still hoping it’s nice weather for walking (70s?). My suggestion is to pack layers. Sleeveless shirts, cardigans, scarves. Bring a midweight coat. If it’s cold, realistically you won’t be outdoors much beyond walking to the convention center and restaurants. I’ll see you there! Have a safe trip. Good to see you blogging again. No advice re travelling to give…just feeling a little bit envious really! 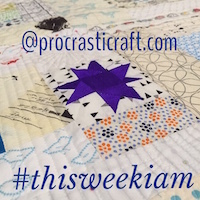 #thisweekiam – get the button! On the road to QuiltCon!